Change your life with an Ayurvedic Health Counseling appointment with me! Find ways to sleep better, feel more energy, experience spaciousness in your mind, and feel hope around your overall capacity to heal. Receive a full assessment of your health from a holistic perspective using the time-proven diagnostic methods and remedial measures from one of the worlds top three internationally recognized medical systems. I will tailor a specific diet, assign certain types of yoga, mantra and changes in your daily routines to help you reach radiant and health and give you the tools to heal your life. I am also a Vedic Medical Astrologer (15 years) with a Masters degree in Ayurvedic Medicine and can "see" the medical imbalances clients might be predisposed to, as well as when illnesses might arise and dissipate mysteriously. This knowledge is invaluable as it is considered the fabric of your unique blueprint, genetically, spiritually, physically, emotionally and mentally. You can heal yourself by simply understanding "why", "when" and "how". I was born with a gift to help others heal and shed insight into the cloudy places. I brought Ayurveda to Rhode Island in 1997 after graduating from The Ayurvedic Institute in New Mexico. I have helped many people since then and am honored to continue helping! Book an appointment on the online scheduler below. It’s fast and easy. Your personal birth constitution in terms of Vata, Pitta or Kapha. Ways to feed your microbiome, eat for vitality and have a calm, clear mind. 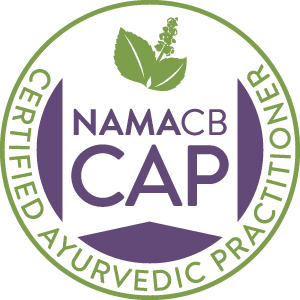 View My Professional Member Profile on the National Ayurvedic Medical Association's Website Here. Investment: $108 for the first session (usually 1.5 hours or longer). $50 for returning sessions. Sliding scale offered for those in financial crisis. Ayurvedic Pulse and Tongue Analysis are Profound Methods for "Reading" Your Constitution and Other Health Conditions!